You’ve done the planning for the logistics of the campout. You’ve used SignUp.com to organize transportation, chaperones, waivers and who is bringing what and how much. But, um, what will you do when you get there?? 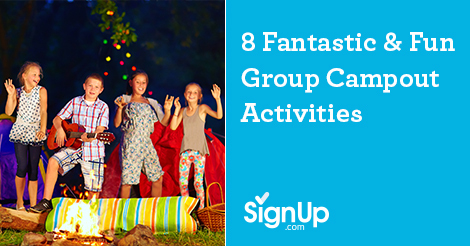 If your campers aren’t so much inclined to sit still and be one with nature, here are some ideas of how to stay busy and have fun. Find the Camp Counselors. The object of this game is to find the hidden counselors. Begin by providing each camper with a pencil and paper. Keep the campers at base camp until all the counselors hide. After the counselors are hidden, the campers search for them and get signatures from each counselor as they find him/her. The first camper who gets all the counselor’s signatures wins. The Good Guys and the Bad Guys. Divide your group of campers into the “good” guys and the “bad” guys. The bad guys hide and the good guys find them, arrest them, and bring them to “The Jail,” a pre-designated location. When all the bad guys are in jail, the players change places and play starts again. Sardines. An “opposite” hide-and-seek game, only one person hides. The other players search for the hidden camper and hide with him or her after finding. The loser is the player left when all the others have hidden. The loser becomes the next person to hide. Capture the Flag. The object of this active game is to capture the other team’s flag. Divide your group into two teams with a designated play area. Each team hides its flag on one side of the playing area. Teams attempt to find the other team’s flag. At the same time, team members must avoid being tagged by members of the opposing team. If tagged, they go to “jail,” a designated area on the opposing team’s side. They only get out of jail if someone on their team manages to get to them without being tagged. The game ends when the time is up or when one team captures the other team’s flag. Blob Tag. A type of reverse tag, the object is to be the last person left untagged. Designate one player to be “It,” and begin tagging the other players. Every time a player is tagged, they link arms with those who have already been tagged. As they do so, a blob of players forms. The person left when all the other players have been tagged and become part of the blob is the winner.